Aqua 30 Coex is a new liner formulation that allows for the tear strength and puncture resistance of the high quality Aqua reinforced polyethylene (RPE) series but also adds an extra coextruded layer of coating. This extra film layer enhances the base materials U.V. and weathering resistance along with giving the geomembrane an extra layer of leak protection. 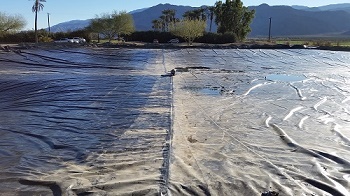 Aqua 30 Coex liner comes with a 20 year U.V & Weathering warranty and can be used in several critical applications as well as tank liners that put a lot of pressure on standard geomembrane liner material. Aqua 30 has many of the qualities of our Reinforced Polypropylene (RPP) line of geomembrane liners at a reduced price. Please contact Western Environmental Liner today to learn more about the Aqua 30 Coex Liner.